John Shirlow was born in Sunbury, Victoria and studied at the National Gallery School 1891-94 and with Arthur Louriero in Melbourne. 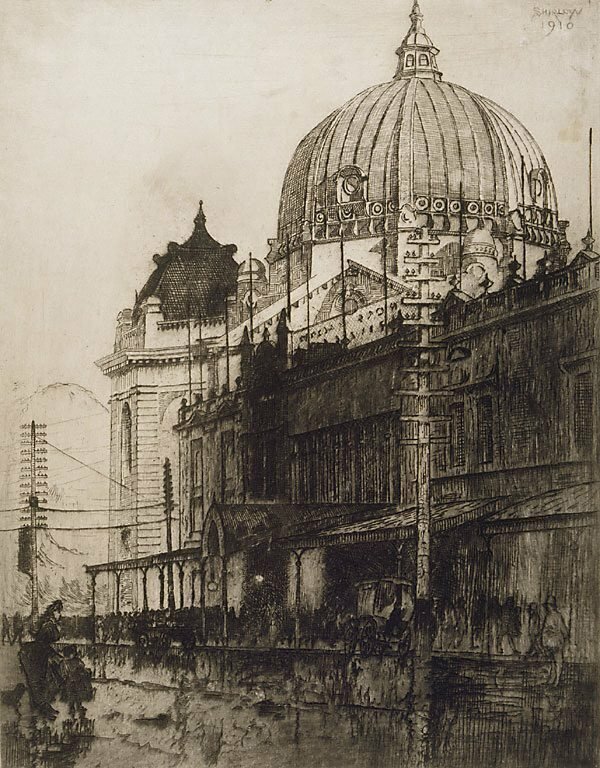 Shirlow pioneered etching in Australia, inspired by the collection of prints selected and purchased for the National Gallery of Victoria by the English artist Hubert Herkomer in 1891-92, particularly the etchings of James McNeill Whistler and Charles Meryon. He made his own etching tools, grounds and inks and built a wooden press out of red-gum. In turn Shirlow influenced Lionel Lindsay who wrote; 'I owe to Shirlow my first impetus to etch, for it was on seeing his little plate The saw mill exhibited at the Victorian Artists Society that my student's mind was struck by the fact that etchings could actually be made in Australia'. (L Lindsay 'Etching in Australia' p.296). Initially Shirlow worked as a lithographic printer. He also taught etching at the Working Men's College (now RMIT) in 1929 and was later art master at Scotch College, Melbourne. He was a trustee member of the Felton Bequest at the National Gallery of Victoria, Melbourne. Signed l.r., pencil "John Shirlow". Signed and dated in plate to print u.r., "SHIRLOW/ 1910".